The Obama Administration is often accused of being sluggish in granting permits for projects to ship liquefied natural gas (LNG) to countries that do not have a free trade agreement with the U.S. Critics claim it has thus denied the U.S. a historical opportunity to become a leading natural gas exporter on par with Russia and Qatar. Whether ten approvals out of forty applications in four years is sluggish or not is a matter of perspective. But the debate on the pace of approvals has masked a much more important fact: American gas is no longer desired abroad, no matter how many permits are granted, and certainly not in Asia – the fastest growing market for gas. Here is why: LNG prices in Asia are linked to oil prices; when oil prices were high Asian economies were forced to pay exorbitant prices for their imported gas. In the case of Japan where the Fukushima incident led to the shutdown of 54 nuclear reactors, at one point LNG prices reached almost $20 per one million British thermal units (mmbtu). During that time the North American fracking revolution unleashed a huge amount of gas into the market, creating a fantastic opportunity for the U.S. gas industry to capture the arbitrage between Asian and North American prices and export daily billions of cubic feet to foreign destinations. So promising was the LNG play that a 2014 report by Citi Group projected that the U.S. would become the world's leading LNG exporter by as early as 2020. America natural gas may not be attractive for most buyers in the foreseeable future. But ironically the same fracking miracle that flooded the North American market with surplus natural gas also led to a spike in oil production and contributed to the fall in global oil prices. Since oil and gas prices are linked, the collapse in oil prices led to an even sharper decline in LNG prices. LNG spot prices in Asia have recently fallen below $7/mmbtu, a level nearly one third of last year's peak. While at the well head U.S. gas price –below $3/mmbtu – is among the cheapest in the world, when slapped with liquefaction and tolling costs the price could reach $9/mmbtu, no longer competitive in many markets including Asia. The slowdown in China's growth, the European recession, the restarts of Japanese nuclear power plants, the rise in Australian LNG exports, the new gas pipelines China and Russia are planning to build in Siberia and the specter of Iranian gas entering the market once the sanctions are lifted all mean that in the foreseeable future America's gas may not be attractive for most buyers. The Caribbean basin and Central America could be the best markets for American gas. With the dream of becoming a major player in the Asian market quickly fading the U.S. should consider alternative uses for its gas. America's immediate neighborhood, the Caribbean basin and Central American markets, could be the first markets for America's gas. Many of those countries - Granada, Jamaica, Barbados, Nicaragua and Cuba to name a few - still generate large portions of their electricity from oil products and their economies are susceptible to occasional oil shocks. The same is true for Puerto Rico, which is effectively bankrupt and could benefit greatly from switching its power sector from oil to natural gas. But most of those markets are too small and too poor to justify the construction of LNG receiving terminals where LNG is re-gasified into dry gas that can power electricity turbines. For such regional markets the gas can be delivered in the form of low pressure Compressed Natural Gas (CNG) on board dedicated vessels. This way the gas can simply be shipped in its gaseous form without having to go through a costly and energy intensive conversion into liquid and then back into gas. Moving gas in CNG vessels would offer the U.S. gas producers new nearby markets while sparing the customers the need to invest billions of dollars in LNG infrastructure. The U.S. is home to less than 1% of the world's roughly 18 million natural gas vehicles. 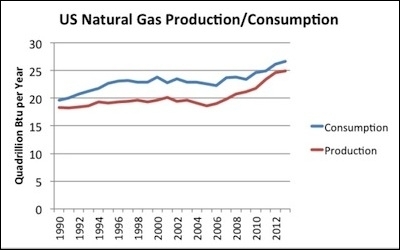 The second potential market for America's gas is the transportation sector. While a large amount of gas is used for power generation, with important economic and environmental benefits, only one percent of U.S. natural gas is used as automotive fuel. This is a real folly. Even at the currently depressed crude prices North American natural gas is still three times cheaper than oil on an energy content basis. But despite the cheap price of our gas, the U.S. is home to only about 150,000 of the world's roughly 18 million natural gas vehicles. In China, where natural gas prices are 3-4 times higher, gas is used much more widely in vehicles. A new report by the United States Energy Security Council reveals that though China's overall vehicle fleet is half the size of America's it has ten times more natural gas vehicles and twice as many natural gas refueling stations than the U.S. Furthermore, China is in the process of converting its vehicle fleet to run on methanol, an alcohol fuel that can be made from natural gas as well as coal and biomass. Indeed, though poor in gas China seems to be utilizing the resource better than the gas-rich U.S. The answer to the North American gas glut isn't building multi-billion dollar LNG terminals along U.S. coasts with the hope of exporting gas to distant markets where it is no longer wanted. Promoting innovative approaches to exporting gas to our neighbors in configurations other than LNG and advancing fiscally conservative solutions to opening the transportation sector to natural gas-derived fuels are the only ways for U.S. natural gas producers to ensure that if they continue to drill for more gas there will be takers. Gal Luft, a fellow at the Middle East Forum, is co-director of the Washington-based Institute for the Analysis of Global Security.